For Mac users, you can view and edit PDF files with the pre-install PDF tools like Preview. However, these PDF tools do not allow you to create PDF forms on Mac. Especially after you have upgraded your Mac to the new macOS Mojave, things become harder. While a third-party PDF Form Creator for Mac like PDFelement Pro can be the best helper for you. This guide will show you how to create PDF forms on Mac (macOS 10.14 Mojave included) without any fuss. Searching from the Internet, you might find PDF form creators include CutePDF PDF Form Filler and Blueberry PDF Form Filler, but these programs can only run on Windows system. Fortunately, PDFelement ProPDFelement Pro allows you to create PDF form on Mac (macOS 10.14 included) as if you were simply using conventional office suits or word processors. You can create PDF form with its useful form tools like text field, check box, list box, radio button, and more. Besides, it provide you with many PDF form templates, which you can download and customize the PDF form. For Windows user, you can download PDFelement Pro for Windows version. First, launch the PDF form creator for Mac El Capitan. And go to the "File" > "Create", and then click on the "Blank Document" option to open a blank page. Then you can go to the toolbar and click the "Form" option to start creating your PDF form. You can apply Text Field, List Box, Radio Button, Check Box, Button or Dropdown Menu to your form. You can double click on any form field to change its properties. You can specify a name, change the common properties, modify the options, customize the appearance, and more. Note: After which, you can also start setting things up by modifying the page or paper size of the document and the font styles that would be used. 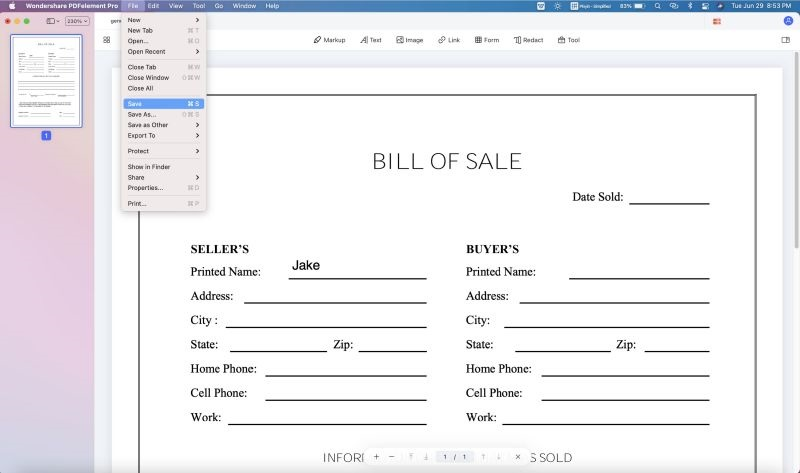 By default, this conventional PDF form creator for Mac would usually come in an 8.5” x 11” (Letter Size) paper space and Times New Roman 12 font style. However, they could be modified easily. After setting things up, the next step would be adding the particular pieces of information that have to manifest throughout the document. 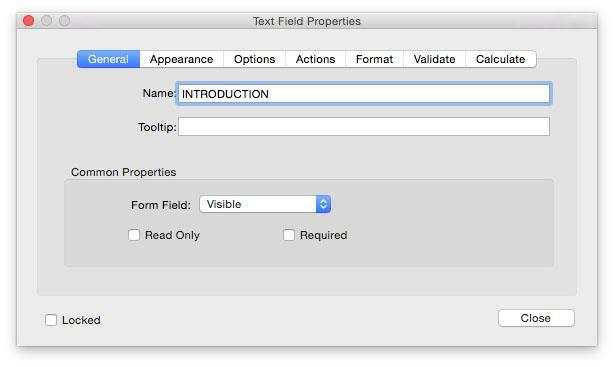 You can use certain tools such as the text box modification, shape creation, and the user form creation tools of the PDF creator for macOS Mojave. These tools are strikingly useful for people who particularly wanted to create easy-to-use and easy-to-fill forms. Just click "Edit" > "Add Text" to input the information and data. Lastly, save the PDF form that you have created. This process should be easy with PDFelement Pro Form Creator for Mac (macOS Mojave), since the default file format of these applications is the Portable Document Format or PDF. After saving, you could easily edit or share the PDF form. If you want to convert Excel and Word to PDF form, PDFelement Pro for is a great helper for you. This PDF creator enables you to convert Word, Excel and PPT to PDF with original layout.